Welcome to the first issue of Sputtering Components’ new quarterly newsletter, lON SCI™. This publication was created to keep our customers informed about Sputtering Components and to recognize our talented, experienced, and engaged employees. 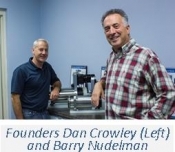 Dan Crowley and I began this business in 2001 and since that time, we have come to understand that our customers’ success is the key driver of our own company’s success. This statement represents an attitude that resonates throughout our organization. The dedication of our employees, the industry experience that they bring to their jobs each and every day, and their commitment to exceptional customer service have all contributed to these successes. At Sputtering Components, we strive for excellence. We enjoy a reputation for high quality service, professional expertise, and personal involvement. We are committed to maintaining a high level of confidence and excellence in all we do by employing the right people in the right jobs. We recognize at Sputtering Components that our most important asset is our people. The guiding work principles of Sputtering Components and its people include customer service, teamwork, integrity and innovation. ION SCI™ will be dedicated to keeping you informed of new products and innovations, introduce you to our employees, and to provide you with other noteworthy information. I hope you enjoy reading our newsletters. Jerry Kelly, SCI’s first official employee, started with SCI on a part-time basis in 2003. During those first three years, Jerry helped Dan with assembly of the early cathodes. “I sent Dan my resume every fewmonths.” said Jerry. “The early jobs included everything from parts washing to assembly and crating. 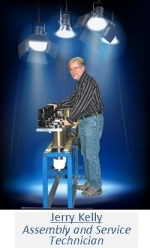 We did whatever was needed.” It was a great fit with his 15 year background in the vacuum industry, which included working for Viratec Thin Films (now TruVue) and Sage Glass prior to coming to SCI. Jerry’s role at SCI has evolved over the years. He has played a critical role in training customers in end block maintenance by being the hands and face behind all the maintenance videos. He has traveled to many countries to help with service and training. Jerry and his wife, Cindy, have been married for 13 years. He has two sons, one granddaughter, one grandson and enjoys shooting his bow and deer hunting each fall. Sputtering Components Inc. is pleased to announce a service email address for all technical questions and product issues related to SCI products. SCIService@sputteringcomponents.com will serve as a single contact point that will help to address our customers’ issues and questions by connecting them to the technical support team who is best suited to answer their questions. The Technical Support and Engineering teams monitor this account to ensure you receive a response within 24hours of receipt. Please be sure to send all technical or product related questions to this new account. HOW RELIABLE ARE YOUR SEALS? SCI follows a rigorous seal design with the use of a qualification system to ensure its seals can be warrantied for 2 years of service. All seal designs and seal suppliers undergo a strict review of physical attributes to ensure they meet our high standards for sealing performance, mechanical, electrical, and magnetic properties for both water and vacuum seals. Our qualification process includes the seals being subjected to 10,000,000 revolutions in our accelerated rotation testing station. Once our seal designs and vendors are qualified for production use, a shipment sample goes through an identical test before being approved for use in our end blocks. This strict process and superior design allows us to offer our customers a 2-year warranty for most new end blocks. For the 3rd year, SCI is sponsoring a 4-person Team Challenge during 5K Fun Run and Walk at the SVC TechCon in Indianapolis. The first team across the finish line will win the traveling trophy., The first 4 members to cross the finish line for the winning team will also receive an additional award. For details, contact Nancy Ness at NNEss@sputtteringcomponents.com.